Nope, wrong. A book cover is all about the text. Without the text, your reader is lost. Who wrote this? How will I find it? What’s it about? The title and author name are absolutely vital. Let’s put it this way. You could have a solid color (well, okay, maybe a little grunge or somethin’ going on!) cover, and if the text is right, that’s all you need to attract the eye. The typography in a perfect situation is part of the art of the cover, and it wouldn’t look right without it. Make the author’s name big. Really big, bigger than you think you need to. When a reader sees an ebook for the first time, they see it in thumbnail, and they need to be able to see the author’s name and read it. The title should probably be almost as big… and the title should not be a very long one. I’ve made that mistake. The story of Little Red-Hood and the Wolf Man is a terribly long title. Do not, under any circumstances, use a font that you would use inside of the book. No Times New Roman, Calibri, Georgia… it will look wrong and put your readers off even if they couldn’t say why. Ideally, you would use a free font or one that you have purchased and are sure you have commercial rights for (do check. Some are licensed for personal use only). I use dafont recently because I can open the search options and sort for 100% free or public domain. No, you don’t want a font that is hard to read on the front cover. But you do want a font that subtly signals what genre you are presenting. Look at Anita Semi-Square and tell me what that reads like, then go take a look at Endor… one is great for SF, the other for Fantasy. You wouldn’t want to mix them up! Never use more than three fonts or variations on fonts on a cover. This is something I learned in general graphic design more than a decade ago, but it’s a universal. You could have a title font, a complementary author name font, but then for other text elements, I’d stick with either the author name font, or an italic version of it, if you must. Don’t put too much, or too little, on a cover. Go grab a book by a traditional publisher, and take a hard look at it. Chances are, you will see between 4-5 text elements. Title, author name, blurb, and either ‘bestseller’ type text, or ‘series name’ type text. You might see all of those. If you put out a cover with only Title and Author name – and those very small – it’s going to look amateur to your readers. They might not be able to say why, but they will notice. 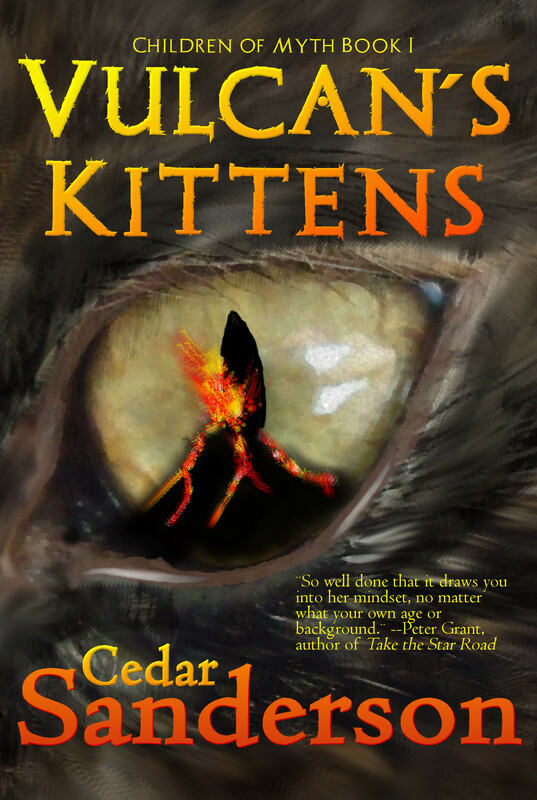 So… I decided I needed to re-cover Vulcan’s Kittens, which might not be the first book cover I ever created, but it is close. It was badly dated, with the art appearing ‘in a box’ which is now a dead giveaway for an indie or self-published title. Don’t do it. Seriously, it looks bad. The first thing I did was to go looking for the files… and discovered that I had not kept the original Gimp files. Without the ability to pull it apart into layers, I was forced to create the whole thing from scratch. So I painted an eye… LOL. You don’t have to do that, I’m just a little crazy. I wanted a darker cat, as the original cover art is a photo of a sandy tabby, and none of the kittens in the story are sandy-colored. And I wanted to keep my text for the title in keeping with the mythology theme. Most of all, I wanted to keep the cover in a similar design to the other book in the series, The God’s Wolfing, which is an important thing to keep in mind. I began with a new image in Gimp (I am using Gimp because it’s free, powerful, and if you use the other programs you ought to be able to backtrack easily from it), set to the dimensions I would need if I am using this in print (which I will be). Then I opened the art as a new layer, sized it and tweaked it until I was happy with it, and started laying text on it. I created a transparent layer above the art, but you don’t have to do this step, as each text element will appear as a separate layer. This does, however, give you an idea of what the art looked like when I started. You will see later that I changed it when close to finished. I started by looking online to find a font, since I don’t have all my fonts on this computer yet. Once I had a couple of options uploaded, I created a text box, wrote the title, and sized it. 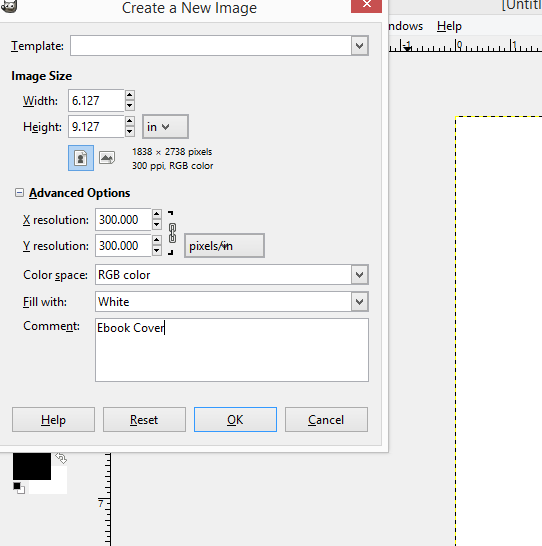 Keep it from touching the edges – you will need at least a 1/4 in bleed if you take this cover to print. See that you can adjust color, kerning, and spaces between lines to keep your words straight. I applied a couple of filters to this text, a bevel to make it look raised, and a drop shadow to make it look like it is floating above the art. Because I was playing with a fire theme for this book, I went with red and yellow. Later, on the Author Name, you will see I’ve applied a gradient to give the text more life. You do not have to do all of these. You should do something, so it’s not flat on the page. Give your text some life! Skipping ahead a bit, you will see what I’ve done. The series identifier is near the title. It would look off if it were closer to the author name than the title. My last name is very big, and first name tucked neatly away. You do not have to – and if you look at bestseller titles, you will see most don’t – put both names on one line. I’ve increased the size of the art. I wanted the eye to be central, and, well, eye-catching. I might take a look at this in the morning and decide I want to change something, I often do after sleeping on a project. But I wanted to walk you all through the whys and wherefore’s of laying text on a cover. I’m sure I’m missing something, but this is already pretty long. Ask in the comments, I will be around to answer questions today, as will others who can help. Oh, and by the way, I have two ebooks on a serious sale today. Just in time for Christmas gifting, they’re a dollar on Dec 20th, but they will go up slowly for a few days, so jump on them now! Pixie Noir, which is usually $4.99, and Farmhand, my Lilania Begley book. I have now written at length about designing a book cover. 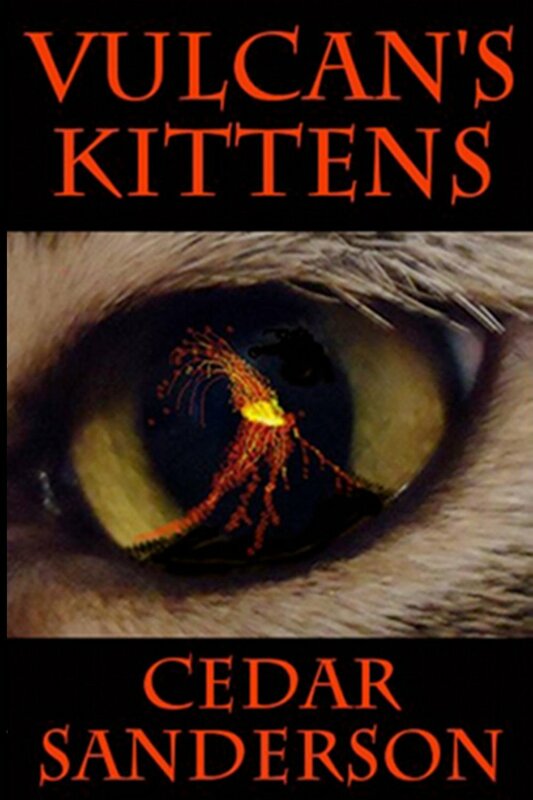 You should be able to mine some useful information, and see the new cover for Vulcan’s Kittens. I guess it’s true: rules are meant to be broken. In fact, almost as soon as you lay one down, you’ll see exceptions. Frex, I wouldn’t be so quick to dismiss letterboxing (and you probably aren’t, but there I am being contrary). It can be visually very stunning. (Still to be sure stunning visuals CAN distract from the purpose of the piece — a point that’s sometimes hard to get across, even to myself.) But there MUST be a reason to do it that makes sense on the image’s own terms. I agree that the way you did the original cover is probably not the best. I would want to frame the illustration with rules of gold or red, and “add noise” (that’s the Patch Factory term of art) to the background top and bottom — maybe a jacquard-weave texture in paisley or something. On another tack, some gratuitous advice: I don’t like the title font. I know, I know, de gustibus. But it looks… off to me. Something about the shapes of the serifs and the proportion of the serifs to the strokes. Now it’s done, there’s little point in changing, but I might have suggested Albertus or another spur-serif face, which would also admit to being set the way you’ve nestled your first name between the S and the vertical stroke of the d in your last. Neat trick. I really like that. Well done, you! Alternatively, a bolder version or similar — perhaps Copperplate Gothic 33 (extra bold condensed, if memory serves) — which has fatter strokes and a less-spindley look to the individual glyphs. This cover is not set in stone… are you not like the Title font, or the author name font? They are different. I always let my work sit a day or two before making any changes I can’t easily reverse. The title face, which, to my uncertain pre-coffee eye looks like a variant of Copperplate Gothic 31 or 32. The author face, which feels vaguely like Arrus or Souvenir, is fine. Excellent, in fact. To be emulated. Except… (There’s always a “but” inn’t there?) I’d play with the gradient fill on “Cedar” to try to enhance the contrast with the background just there. The title face is a font called Archeologicaps, medium. I wanted it for the faintly ‘myth’ feel of it. I’ll see what I can do about gradient fill tweaking 😀 And I did fix the typo, thanks, Pam! A general rule of thumb I apply is try not to use thin fonts as they do not show up or read well in thumbnails. The book cover I just completed this morning (A medieval romance) has the first letter of the title in “Old English Text” font with the rest of the word in “Black” font. If I had used “Old English Text” through the hole word it would have been an unreadable mess. Always, always, always look at your cover final in reduced (thumbnail) form to see what it looks like. If you can’t read it when it’s an inch tall then you need to fix something. hole=whole. I need to caffeinate myself before posting. I agree with the desire to go for fat strokes in my typeface choices. Comes from years of trying to enhance (read: “make readable”) art made for a 12×12 format when presented in a 3×4 frame. 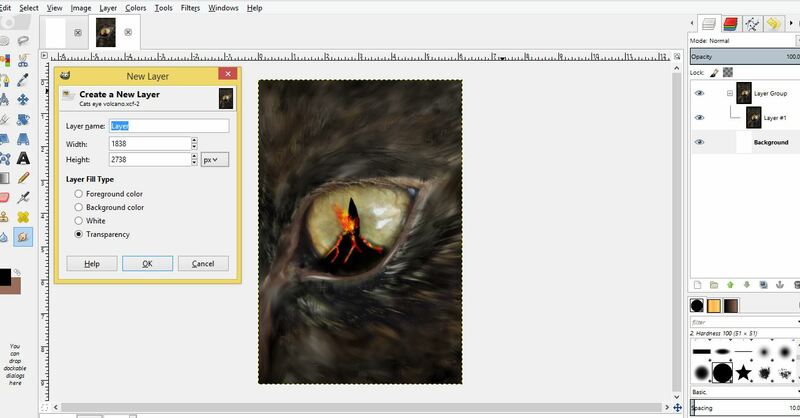 You _might_ want to remove one of the Os from Boook, and can you offset the volcano to show all of the cat’s pupil? So I pretty much made all but one of the listed mistakes on the most recent cover that I did. *sigh* At least I’m consistent. And yeah, I was rushing to try and get it out and “hot” by Wednesday so I’d have live links by Friday. You can always go back and swap it out. That’s the beauty of e-pub. I need to go over all of mine and update them. That is awesome thanks for sharing! Yes, it is pretty darn nifty 🙂 You always have nice covers, too. Passing on a bit of information to keep in mind, for about 10% of the male population using dark red text on a black background does a very nice job at making the text invisible. Male pattern color blindness in the red green range is how it’s referred to. I’m pretty sure there are testing websites, where you can run your image through a couple of different “colorblind” filters and make sure it’s still readable. Check accessibility help sites. Good to know, I altered the Title from all red to a gradient, hopefully that helps. What I want to know is – Why are your two example fonts named backwards? Well, primarily, I wonder why whoever created the Endor font gave it a name that most people will associate with Sci-Fi.